Tour continues on. I am back in Athens for two quick days. Taking the morning to work just a little bit on tour promotion stuff, but more importantly letting my mind stop spinning. I feel like that's all it has been doing. Spinning along. On the road you get a lot of time to think, to reflect, and to have absolutely nothing to do. More on this in a second. On Saturday, as we were pulling in to Atlanta, our trailer broke. More accurately, I broke the trailer... As we were pulling up to our venue in midtown, it fell completely off the truck. What we came to find was that the tongue on the trailer had been completely bent after I tried to turn it around and hit a curb at the wrong angle. After trying to hammer it for a little while, with no success, we were stuck. For a moment you get this sinking feeling, "wow this is it." We have no way of getting our stuff out of here, we're screwed. It's funny looking back on this now, but in the moment that was such a loud voice in my head. "You messed this up... if only you were more careful... if only you had planned better..." all of this racing through my mind. I am so thankful to have Zac and Carly on my team. Not once did I ever feel like they blamed me, but rather, what was a problem for me became a problem for all of us. That's family. What's yours is mine. God sent some angels in the form of Tommy, Mike and Matt (Tommy's neighbors). It would take a second to explain on here, but they were literally in the right spot at the right time, and helped us to move the trailer and put us into contact with people who might be able to help us. We push the trailer up the hill and play the show in Atlanta, a beautiful night atop a roof with a view of trees and the Atlanta skyline. On Saturday we call a handful of trailer repair services and find one that can repair the trailer in the same day. We get the trailer towed down to Jonesboro and spend the afternoon there. We eat Mexican. Between waiting, driving, calling, and driving some more, the whole ordeal lasted about 5 hours. We were dead tired in the middle of it, and it felt like a giant wrestling match in my spirit. "Do not get discouraged. Trust God. You are in the right place. Love. Continue in humility." This was the reminder in my head as I continued to worry and as I looked at the situation that had no guaranteed success. 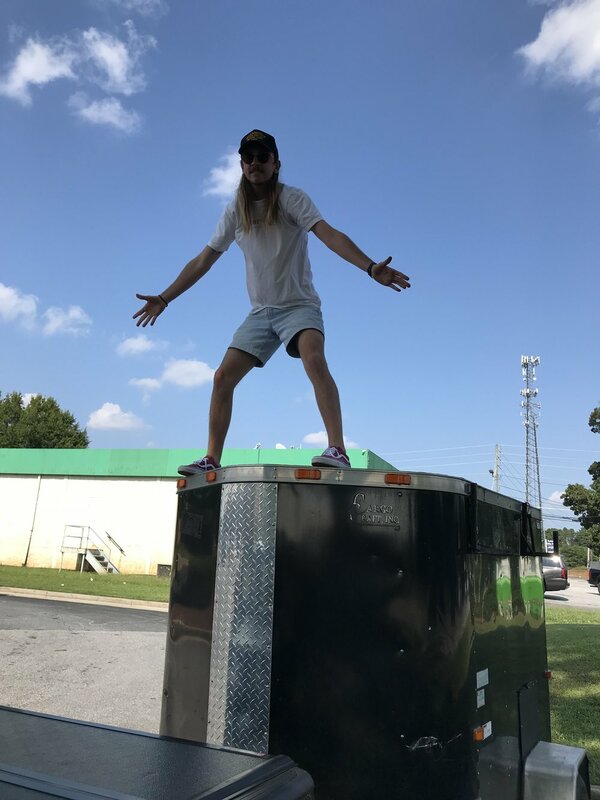 But you know what is amazing... We were able to get the trailer towed 40 minutes south of Atlanta, fixed, loaded back up in Atlanta, and hauled to our next show 30 minutes north of Atlanta... and the show continued on with no hiccup. It was actually one of the most beautiful shows I've ever played. I was filled with so much thankfulness. I felt like nothing could get in the way of the dream. I felt like my spirit, our spirit, conquered that day. As difficult as that situation was, I think it was the most important thing to happen on our journey so far. Something in the atmosphere changed. Somewhere in me... I trust God even more. My faith grew. I am covered. I am taken care of. I realize I actually loved the story and the people more than a cookie cutter, according to the plan, situation. And I am sure, as time continues, it will be more laughable that we even despaired about that happening... but what a great lesson and experience. God came through in every way. He sent people to help us. People who were kind and supportive. Even everyone at the trailer shop seemed to care. Personally, He surrounded me with two friends who have my back and didn't once blame me for anything. Also, before we hit the road a friend gave me $200 for anything that might come up on the road. The repair of the trailer costed $189. 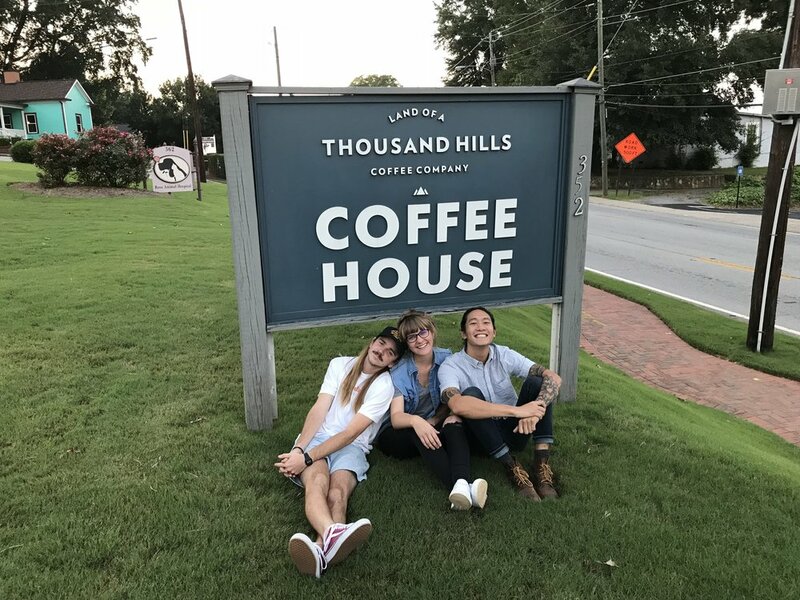 God gave us a way to be back up and running at the show on time and even early enough to get one of my favorite deserts, affogato, in Roswell. It is hard to deny God's amazing plan... He took care of us. And to top it all off. As we were loading into the show in Roswell, I found this waiting for me on the stage. One of my best friends and mentors left this for me. I didn't even have to read it. It just healed me, it encouraged me, it reminded me of all of us connected together who are walking together, praying together, pursuing life and God together. I am still amazed and feel the wind on my back that this gestured breathed. Extra Credit: I am truly impressed that any human has read this far down. We hardly read things that take more than five minutes these days. Here are some extra thoughts that I have had that might encourage you. No lesson, just process and maybe some revelation. I realize: It's not good to be alone. Alone physically, alone in your head, alone in your pursuits, alone in your dreams. It's just not good. I'm not made to do things without others. I struggle with this because I live in the illusion that I can do things better, faster, and cleaner without the help of others. But a loneliness haunts me when I live there. I am so thankful for this tour. While I am busy, the lifestyle has forced me to slow down, has forced me to be in community, and has ultimately reminded me the beauty of sharing life with those around me. It has been an especially hard couple of weeks emotionally, and I am trapped so much of the time in my own worry. I live in false realities that haven't even happened yet. The word for that is conspiracy... But, the beauty of people is that they can pull you out of those places if you will let them. The power of God is that He gives us a different way to live, if we will trust Him. I also am learning that I am not meant for broken connection. Actually, everything I do is for connection. Connection with God, with my purpose and with those around me. In my brokenness I run from connection because it is naked and uncomfortable. I want you to think that I'm perfect and I know that the closer you get the less perfect I become. I have a habit of cutting people off cold in my mind the moment they get too close for comfort... to break the connection because it doesn't seem or feel perfect. But, when connection breaks, it rips my soul. It's against my design. My prayer has been a softening of my heart and a trust in those that are around me and a desire to preserve connection at all costs. My prayer has been for courage to let others into my heart and to fight to know theirs. The share my life without regret. To ask for help. To give. To be myself, warts and all. My prayer has been for love. My prayer has been the ability to forgive myself and my own life for being messed up. My heart cries out to know and be known. And you know what, as I have lifted the astronomical expectations from myself and from others to be God, I feel a peace drape over my heart like a blanket. It is okay. You are okay. We are loved. We are on the same team. Let us connect. Share your life with me. and I'll share mine with you. Let's break the broken bread.